DODGSON, Charles. (Lewis Carroll). AN dated Aug. 20, 1890. 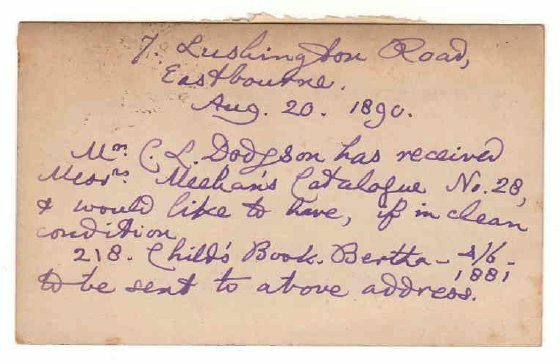 In Dodgson's hand, 9 lines, in the usual purple ink written on a postcard, measuring approx. 3" x 5". 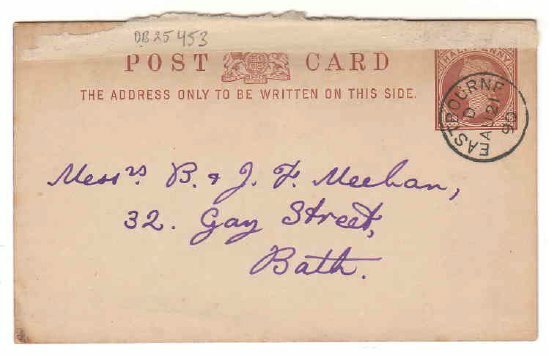 Addressed to Messrs. B & J. F. Meehan, booksellers in Bath, and stating in the third person that "Mr. Dodgson has received Messrs. Meehan's Catalogue No. 28" and ordering "if in clean condition 218. Child's Book�. Addressed by Dodgson on the front. The card is not signed but is in Dodgson hand. Light soling, thing strip of paper attached along the top edge (presumably from where it was previously tipped into a book), otherwise near fine.